Having recently returned from a brief stay at a hermitage, my spirit is filled. However, re-entry to the world has left my mind and body weary and numb. Soon I shall sleep. For us Christians of the west, today is Pentecost, the Feast of the coming of the Spirit. (My Orthodox friends will be so celebrating next Sunday). The depth at which I experienced God’s preparation of me for this holy Feast is something more than I can possibly express here. Yet I wish to share a few of the gifts He bestowed. Presented here are two readings, one from St. Cyril of Jerusalem and the other from St. Basil the Great, both of which appeared in the Liturgy of the Hours (Roman) in the last week. St. Cyril’s wisdom, not mine, titled this post. I recorded both readings while at the hermitage (using an app on my cell phone, one of my few concessions to technology) so that I could share the experience with you. 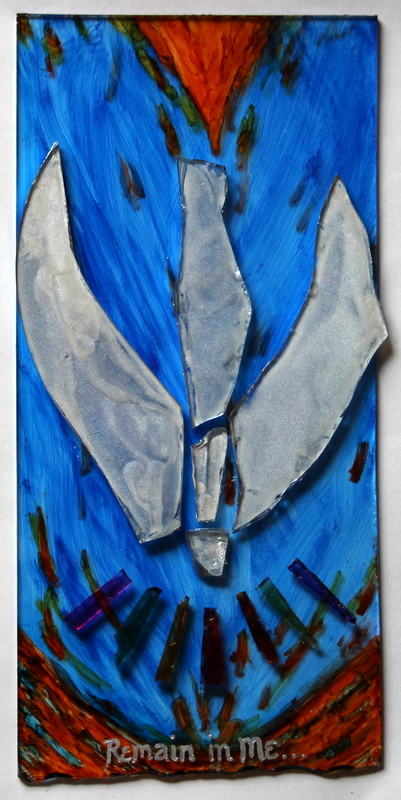 The other gift is a glass sculpture I was allowed to fashion depicting the Spirit as a dove descending, along with Christ’s words “Remain in me”. As with the Cross posted at the onset of Lent, bits of broken glass salvaged from my broken window came together to form the image. May we remain in Him always, by the power, grace and comfort of His Spirit, to the glory of our Father in Heaven. Amen. From a catechetical instruction by St. Cyril of Jerusalem, bishop. In the same way the Holy Spirit, whose nature is always the same, simple and indivisible, apportions grace to each man as he wills. Like a dry tree which puts forth shoots when watered, the soul bears the fruit of holiness when repentance has made it worthy of receiving the Holy Spirit. Although the Spirit never changes, the effects of his action, by the will of God and in the name of Christ, are both many and marvelous. The Spirit makes one man a teacher of divine truth, inspires another to prophesy, gives another the power of casting out devils, enables another to interpret holy Scripture. The Spirit strengthens one man’s self-control, shows another how to help the poor, teaches another to fast and lead a life of asceticism, makes another oblivious to the needs of the body, trains another for martyrdom. His action is different in different people, but the Spirit himself is always the same. In each person, Scripture says, the Spirit reveals his presence in a particular way for the common good. This entry was posted in Uncategorized and tagged Pentecost on May 24, 2015 by mary. Oh my, Mary! Thank you for this. I am going to look fr the quotations so I can read them this week as I prepare for a “second coming”–in at least two senses– on Sunday. I like to go back over words and reflect. Sometimes I question, as in Cyril’s use of “worthy,” though I understand the limits of translation. And the glass art (like the previous one, which I have saved)–so beautiful, so perfectly transformative: your pain reflecting and remaking that of everyone who sees this. Thanks, Al. I have added an addendum to the post to include the texts. Fortunately, others have posted the text to the Internet so that I only had to copy and paste. Both Sts. Cyril and Basil and mentioned being “worthy” of the Spirit. Certainly I haven’t the knowledge to interpret the Fathers. However, my sense is that the worthiness has to do with our repentance. As mentioned in my previous post, The new life, if all of the “rooms” of in the inns of our hearts are full of other things, we cannot hope to entertain such a Guest. Repentance makes “space”. St. Basil implies such a thing by indicating that the Spirit gives to all “a delight limited only by their own nature, not by His ability to give”. He also “guides the steps of the weak”. In other words, we have to want Him; He will not come as an uninvited Guest. And we must make room for Him, make some effort to welcome Him. But He will also help us do that because that is why He comes – to strengthen us in our weakness and guide us to the fullness of Truth.